I have to say that I’m not a writer who writes foremost from ideas or plot. I love creating characters and following their journeys. The very first novel I wrote, which turned into a verse novel, starred characters I had had in my head for years. I’d made more than a few attempts at the story by the time I decided that I’d turn into a verse novel and hopefully, in the process of writing that, teach myself how to structure a novel-in-prose. So how does one create a character? Although I point my students to character sheets, encourage them to use visual devices and suggest the borrow traits from people around them, I’d have to admit that my characters come to me more mysteriously. I hear them first and then, slowly, after some thinking, dreaming and writing, their voices consolidate and become more substantial. After a while, I can see them – or rather, I can see the environment they inhabit. Perhaps I can see how they’d lie on the floor reading, or check themselves out as they pass a shop window. I don’t often know exactly what they look like. That’s far less important than their emotional landscape. I don’t ask all these questions at the start. Often a character waltzes into my head and I go with that for a while until their story begins to take shape. Then I start asking the questions that will help lead me through their story. The answers sometimes change and I have to go back and do some hard revision. I do think, however, that once you know the answers to these core questions, you have a chance of growing the character and the plot together and to me this is the most successful way of writing. If I attempt to graft the plot on to the character, I’ve often come unstuck. Even in my most idea-driven novel to date, The Airdancer of Glass, a speculative fiction for young adults, I had to establish Lulianne substantially before the plot started to work for me. I had to know what she wanted and how far she’d go to keep her makeshift family safe. The novel I’m currently writing is based on some aspects of my mother’s childhood, growing up during World War II. The central characters began their lives based on my own family – but they’ve changed as the writing has progressed. They are no longer my mother and grandparents, but these characters who share some of their traits but not all. They’ve been fictionalised – made both more and less than their real selves. I can see them in my mind’s eye – not their faces – but a gesture, a stance, a movement. I’m beginning to understand how far my character will go to get what she wants, what she’ll learn and how she’ll change. She’s growing hand-in-hand with my plot decisions. It’s a happy writing place to be! 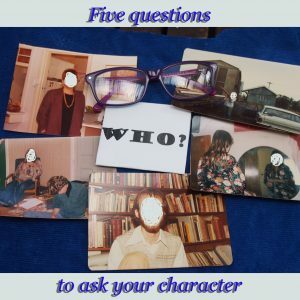 What questions do you ask your characters? How do you begin creating them?